This article appeared in the 3rd issue of 2013 of the Security Community magazine of the Organization for Security and Cooperation in Europe (OSCE). Please see the online article here. A group of young innovators is using a mobile phone platform to connect remote communities in northern Georgia with each other and international security providers. “A man came to our village to visit his uncle. in the morning he went to buy tobacco, but he never returned. We suspect he was detained by the russian border guards,” recounts Giorgi of the northern Georgian village of Dvani. Incidents like this occur regularly in Dvani and neighboring communities since the August 2008 war. Although armed hostilities ended five years ago, the communities’ peace is still frequently disrupted by gunfire, and residents often spot armed groups roaming the fields around their homes. Moreover, local residents who knowingly or unknowingly cross the boundary line between their communities and south ossetia to collect firewood, visit relatives or to trade are often detained by the de facto south ossetian authorities. The European Union Monitoring Mission (EUMM) has been on the ground since 2008 to monitor the situation and together with the osce works to address such incidents through the internationally agreed Incident Prevention and Response Mechanism (IPRM). But monitors and security providers face one crucial challenge: obtaining timely and detailed information. many of the communities are remote and hard to access. Getting good information on local security needs is time consuming and costly, if not impossible. To resolve this problem, a team of conflict analysts and ITprofessionals, with the support of UNDP Georgia, have implemented a pioneering methodology using a mobile phone platform. 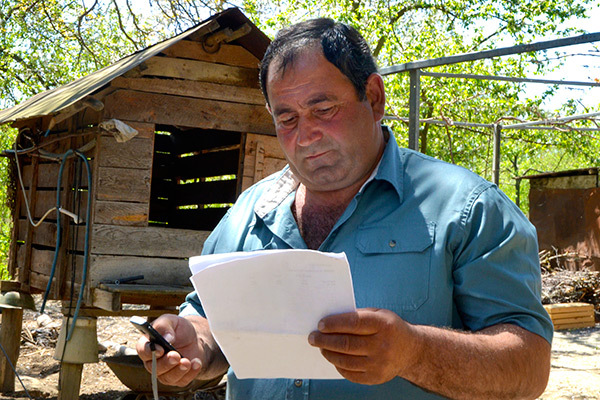 Called Elva, Georgian for “lightning”, it allows conflict-affected communities to share brief reports on security needs, trends and incidents with monitors and security providers. works in even very remote communities. Participation is entirely voluntary. Each week, village representatives send answers to a series of core questions to a central phone number by sms. Using Elva’s SMS questionnaire format, which designates a single letter to symbolize each answer, they can respond to up to forty questions within the space of a single text message by making use of pre-defined answer codes. The sms messages provide information about incidents that have occurred and how they affected the communities. They rate the effectiveness of security providers’ responses and suggest possible solutions to outstanding problems. the few residents with access to a smartphone can use the elva smartphone app to send photos and brief video reports about events in their village. This community-driven information is automatically presented online on elva’s public website in interactive maps and graphs, so that security providers can easily spot security trends and needs and evaluate the effectiveness of their actions. To ensure that the network remains a useful source of information, also in times of relative peace, the project team uses it also to distribute automated local weather forecasts, agricultural news and other announcements. “We had a stroke of bad weather a couple of weeks ago. But farmers in my village had enough time to get ready because I received an early notice about expected frost,” says Zaal, a farmer from Dvani. “There are everyday issues we need to discuss, such as water and irrigation. If South Ossetians could join Elva, it would be much easier to exchange information and find solutions,” he adds.